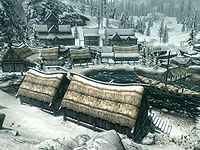 The Pale is a hold in northern Skyrim, with its capital in Dawnstar. It is initially affiliated with the Stormcloaks, but can be captured by the Imperial Legion after completing A False Front and The Battle for Fort Dunstad. It can also change sides as part of negotiations during Season Unending. The Pale is sparsely populated, with safe places for travelers few and far between. The snowy terrain that makes up most of the hold is unsuitable for farming; however, the far southern edge, where not mountainous, is more hospitable. One of three entrances to Blackreach is in the depths of Raldbthar, a Dwarven ruin south of Lake Yorgrim, the largest lake in the Pale. River Yorgrim flows from this lake. Snowberries thrive in the harsh, snow-covered environment, but the sturdy blue and purple variants of the mountain flower can also be found. Along the coast, Nordic barnacles, clams, and spiky grass dominate. 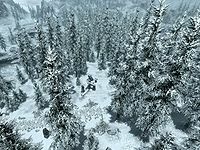 Giants are common here, as are the usual denizens of the snow: sabre cats, wolves, ice wraiths, trolls, and frostbite spiders. All locations in the Pale with individual map markers are listed. There are a few places without map markers listed for their significance. There is one Dragon Mound in the Pale. East of the Pale Imperial Camp. There is one Shrine in the Pale. A Shrine of Dibella east of Windward Ruins. 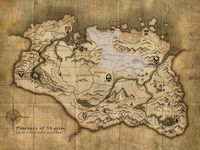 In addition, many miscellaneous quests are located in the Pale. They are listed here.